At a recent University of Wisconsin basketball booster dinner, head coach Greg Gard singled out two of his seniors, not for their on-court prowess, but for their leadership on social issues. Senior forward and NBA prospect Nigel Hayes frequently uses Twitter (@Nigel_Hayes) to express his feelings about racial inequality to his nearly 69,000 followers. A 6-foot-8 forward from Toledo, Ohio, Hayes was a consensus All-Big Ten selection last year after leading the Badgers with 15.7 points per game, but even as he looks to lead the Badgers again this season, he’s focused on more than basketball. A business finance major, Hayes has twice earned Academic All-Big Ten honors and his tweets reflect the opinions of an informed student of history and current events. Hayes answered questions from The Undefeated following a recent team practice. Coach Gard said you have really grown a lot during your college experience. How do you explain how you personally ‘got woke’? Sometimes that’s annoying when people say ‘stay woke’ or ‘get woke.’ They just say it because it’s a popular term. In my case, if you want to use the term ‘woke,’ it definitely fits the bill. In high school and maybe freshman year, I wouldn’t have said what I did or made the stand. There was a gathering of information that started with my AAU coach [Quentin Rogers], who gave me some things to read and look at, a different way of looking at the world, and from that point it was kind of like you get a nibble of sugar, it tastes real good and you just want more. At that point, from freshman year going into sophomore summer, he started giving me books to read, videos to watch, information to digest and then I took it from there. Is there a book that has meant the most to you? If you’re familiar with The Autobiography of Malcolm X, he mentions when he went to jail and got those books sent to him, that’s when he changed, and that’s essentially what happened to me. His autobiography was the book that kind of did that for me. After I read that and learned that he had that eureka kind of wake-up call, I had the same awakening to the world, ideas, things that are going on. Do you feel like racism and police violence are getting worse, or is technology allowing people to better capture what’s happening? I made a tweet that racism toward black people isn’t getting worse, it’s just getting filmed for all to see what actually happens. What happened in Baton Rouge, [Louisiana], may not have been seen 30 years ago, but thanks to cameras, Twitter, Instagram, Facebook, when that goes down, someone’s around, they’re filming it, and then they’re showing the world. So the world becomes more aware of the plight of black people. Do you think technology is a key to improving the situation, since people can now see it? Definitely. When you listen to the great speakers or the great peacemakers of the world, the great problem-solvers, the one thing they always rely on to fix any problems is education. Social media is definitely a great way to spread information. I can put out a tweet, and if it goes viral, up to a million people or more can see it. 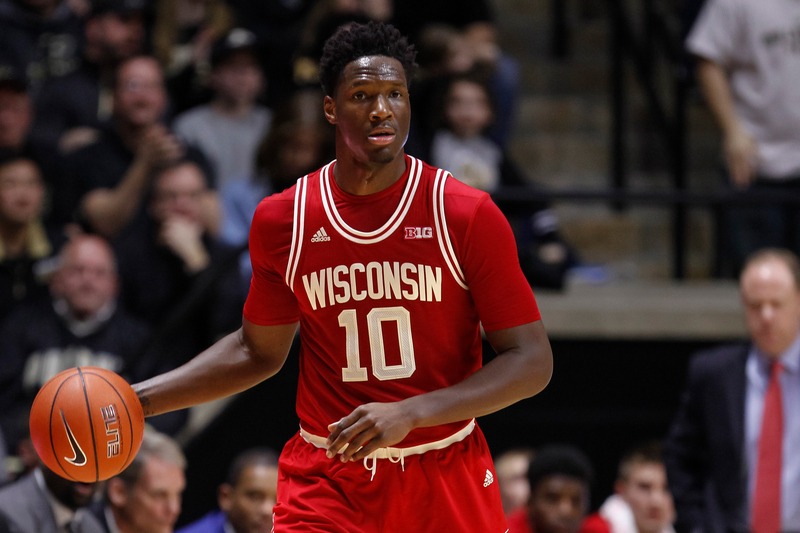 Nigel Hayes #10 of the Wisconsin Badgers brings the ball up court during the game against the Purdue Boilermakers at Mackey Arena on March 6, 2016 in West Lafayette, Indiana. I just use that to help show the world that what I’m saying is actually true. A lot of people are like, ‘No, we’re not racist, we have equal rights,’ which is what someone tweeted at me. And then I can show them a tweet. ‘Look at this video: This man just got shot with his hands on the car, but there’s a white guy running around with an assault rifle, and he gets tased and taken into custody. You don’t see a problem there?’ So, some of the trolls, you can actually use what they’re saying. The more ignorant the better. You can show the world, ‘Hey, I’m not wrong, there are people who still think like this.’ It gives validity to the things I’m saying. #BreastCancerAwarenessMonth is "racist", #AllCancersMatter #AllLivesMatter & #BlueLivesMatter people, you see how silly that looks? Do you feel athletes have a special obligation to speak up? I would say we have an obligation as people to make the world better and leave the world better than when we came into it. That stems from one of my favorite Muhammad Ali quotes: ‘Your service to others is the rent you pay for your time on earth.’ And service to others would definitely be standing up against injustices, inequalities, for those who don’t have a voice, standing up for not only your life and what affects you, but someone else’s life. Being an athlete, you have the same voice you always had, but more people care to listen to it. I think it falls on you to stand up, just as a human being, if there are wrongs, we need to correct them. I’m a person, I’m black, before I’m an athlete. So I have to stand up and speak on race issues the way things are going, not only for me personally, but for my people. Tell me more about your relationship with Bronson. Did he talk to you before he went to North Dakota? We live in the same building, so I went to his room and we talked about some of the issues going on. We talked about what he wanted to go over before he did his interviews with CNN and other media outlets. He was asking me about things from my perspective dealing with the black struggle, and I learned some things from him about what Native Americans are currently going through. The biggest thing for me was that every treaty that they’ve made with the American government has been broken. And there have been a lot of treaties. Here we are in 2016 and every last one of them has been broken. Some see Colin Kaepernick kneel and think he’s expressing patriotism, trying to make the country live up to its ideals. Others say it’s the ultimate act of nonpatriotism. What do you think? I 100 percent agree with Colin Kaepernick. The words ‘liberty and justice for all,’ ‘land of the free,’ etc., black people don’t have that luxury. We don’t live in the world where justice is served. You have white cops who kill people who are not held accountable for it. We’re not enjoying the same rights and freedoms that were promised in all these great documents like the Bill of Rights and the Constitution. So it just makes sense for [Kaepernick] to sit. If you’re mad he’s sitting for injustice, you’re a racist. With the positions you’re taking, how do you anticipate you’ll be greeted on the road by opposing fans? I’ve never been worried about that. The only thing I care about is what my mother and family think about what I’m doing. If my family can say, ‘Nigel, we agree with you, we support you, we’ve got your back 100 percent,’ that’s all that matters to me. If you don’t agree, I’ve got news for you. You’re probably racist. That’s just something I’ll have to deal with. I have the support of my teammates when we’re on the road, my coaching staff, so I’ll definitely be fine. Have your white teammates taken an interest in what you’ve been saying? We’ve had a lot of conversations in [the locker room] about race. There has been growth, and that’s all you ever ask for. When you present facts and information, as an intelligent human being, you have to change your ideas and accept it to grow. Otherwise, you would never grow. That’s how civilizations work. They take information and learn, adapt. If you want to be stuck in your ways and not grow, that’s the doom of people. 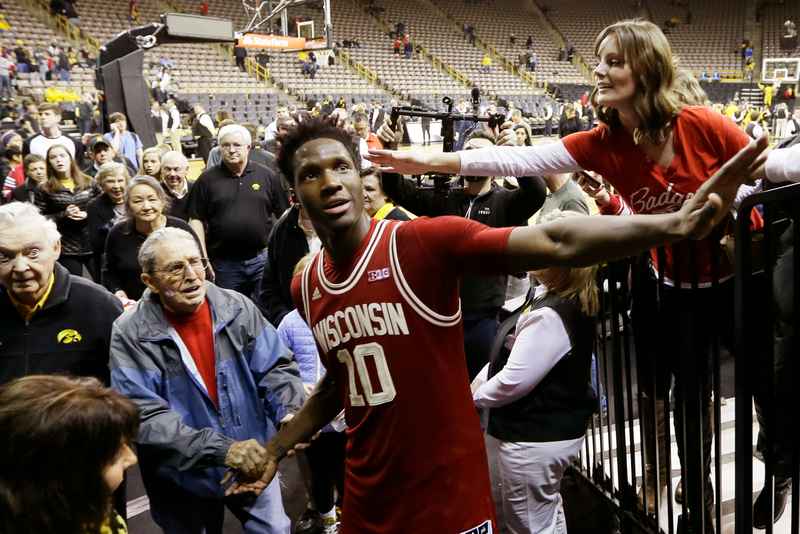 Wisconsin forward Nigel Hayes celebrates with fans after an NCAA college basketball game against Iowa, Wednesday, Feb. 24, 2016, in Iowa City, Iowa. Does combating racism come down to individual relationships? What makes a difference, in your experience? I go back to education and relationship-building. But it’s not just on whites. There’s definitely some onus on people to help themselves. One of the biggest reasons for inequality is economic power and resources. Speaking for black people, we have to do a better job of taking care of our economic resources, the way we spend our money in black communities. That’s an idea I gained from a black [author] who talks a lot about buying black and the black dollar and how to help ourselves economically, Dr. Claud Anderson. Present day, I’m a big fan of [rap artist] J. Cole. He talks about real issues and speaks more substance than most rappers. He really became my favorite when he went to Ferguson, [Missouri], to march with the people, without any extra media attention. And I know he’s a big basketball fan. I’d love it if he came to one of our games. Historically, I have great respect for MLK [Martin Luther King Jr.] and Malcolm X. I love Muhammad Ali. His personality was great, his trash talk, which he always backed up. I would love to say, ‘We’re about to beat this team by 20, I’m going to have 40, and it’s going to be a great game,’ and then I go out and do it and the next thing you know, I’m out at a rally or helping people or supporting the community. Muhammad Ali did a great job of being the greatest of all time in his sport and then also doing what he needed to do to help his people. 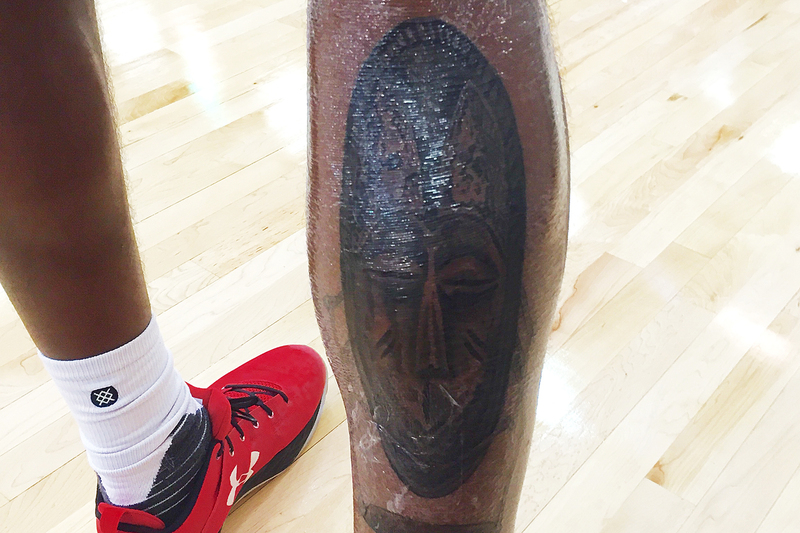 Last thing, what’s that new tattoo on your leg? On my right leg I’m getting a series of seven pictures done by Jake Reynolds, and the tattoos are from African empires. I did some real intensive research this summer, looking up the seven most powerful and prolific, richest, memorable, longest-lasting empires of all time in Africa. I stopped the list at seven because my leg is only so big. From each empire I found an artifact or item revered as a good luck talisman-type of artifact, and I’m going to get those tattooed on my leg. It’s like I’m standing on the strength of my ancestors. That’s the symbolism for it. [This one] is a mask from the Zulu tribe that was supposed to ward off evil spirits and bring good luck to the person or household. Hopefully, it will do that for me. Andrew Maraniss is the New York Times bestselling author of “Strong Inside: Perry Wallace and the Collision of Race and Sports in the South.” His next book, “Games of Deception,” on the first U.S. Olympic basketball team at the 1936 Olympics in Berlin, will be published in 2019.